- Start off by applying the Motives® Eye Base all over the upper lid. This creates a blank canvas for the eyes. -Use the Motives® Pressed Eyeshadow in Cappuccino as transition shade. Apply it all over the lid and in the crease. -Apply Bitter Chocolate on the inner corner an outer v, along with the outer and inner lower lash line. Make sure to do this with a fluffy blush to blend it all out. 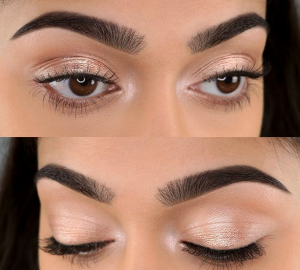 -Go in with Motives® Eye Illusion in Rapture on the center of the lid and center of lower lash line to complete the shadow and to give your eye a glowy finish. 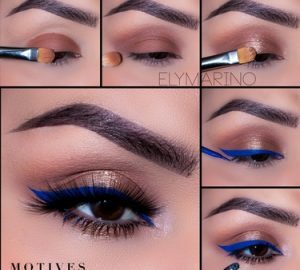 -Use the Motives® Gel Eyeliner LBD to line the upper lid and inner lash line.